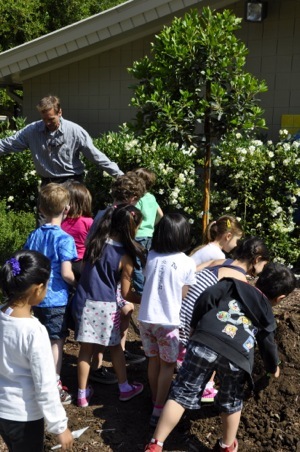 Kindergarten students at Laurel School helped city officials and members of the Environmental Quality Commission plant a strawberry tree in front of their school as part of Menlo Park’s annual Arbor Day festivities. While the state of California celebrates Arbor Day the second week of March, National Arbor Day is the last Friday in April. “Choosing today to celebrate Arbor Day in Menlo Park ties it to Earth Day,” explained Brian Henry (in green shirt in top photo) who hold the title of City Arborist. While the kindergartners noted that trees were good for climbing and hiding, Mayor Peter Ohtaki told the kids: “I grew up here in Menlo Park. When I was your age I had a tree fort. Arbor Day is a special day we set aside to appreciate tree.